It is with great sadness the family announces the passing of their beloved mother, grandmother, great-grandmother, great-great grandmother Dorothy Barker. Mom passed peacefully at Boyne Lodge on October 15, 2017 at the age of 103. Mom was born in Donalda, AB to Oliver P. Moore and Clara (Pfrimmer) Moore, the first of nine children. Mom led a nomadic life. In 1919, the family moved to Manitoba first to Homewood, then Minnedosa, and finally to Castle Point. Mom moved to Winnipeg in 1936 and began work at Middlechurch Care Home. While there she met Dad at a local dance. They married on September 2, 1939. Dad joined the Army as soon as war was declared and was one of the first soldiers to leave for Overseas in December 1939. Mom returned to the family home in Castle Point to have their first child and wait for his return. He came home in July 1945 and their small family moved to Sydney, MB, where Howard & Velma were born. Mom was once again on the move – in 1947, the family moved to Surrey and then Whalley, BC where Barry was born. In 1952, they returned to Manitoba, first to MacGregor then to Portage la Prairie. After 36 years, Dad and Mom moved to Chilliwack BC. 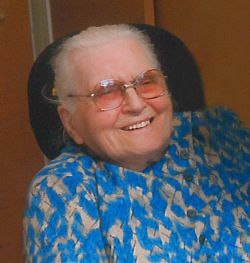 When Dad passed away, Mom lived with Velma & Tom; returning to Carman MB in 2004. Mom moved into Boyne Lodge in 2007 for her last years. Mom lived a very busy life, an avid gardener, prolific correspondent and did beautiful crocheting, knitting and sewing. Her hands were never idle. After the children left home, Mom took up fishing with Dad – managing to get two angler awards. Mom had a fantastic memory and was the family historian. She could relate dates for births, marriages, deaths from her grandmother’s time up to very recently. Mom was a font of stories, especially about growing up and farming when she was young. Her sayings and her ready wit brought much laughter. Some of them were: when asked a yes or no question – “maybe yes, maybe no, maybe rain, maybe snow; how are you? - “fine as frog’s hair”; when told something she thought was silly – “you’re just talking to hear your mouth rattle”. On Saturday the 14th we had her birthday party, she had cake and loved the chips with hot dip, talked to everyone and remembered all her family. Mom leaves to mourn her passing; her children Noreen Cropp of Winnipeg; June Ashe of Moose Jaw, SK; Howard (Arlene) of MacGregor; Velma (Tom Murphy) of Carman; Barry (Patsy) of Penhold, AB; 11 grandchildren; Ron (Gloria) Hilton, Lynne Robson, Mark Ashe, Roxanne Ashe, Tim (Chelsea) Barker, David Barker, Ruth Barker, Tanya (John) Unrau, Trina (Dale) St. Croix, Jeff Barker and Kevin Barker; 19 great-grandchildren and 6 great-great grandchildren; sister-in-law Kay Moore of Chilliwack; many nieces and nephews, cousins Don Pfrimmer (Nancy) Roland and Margene Shorter, Ulysses Kansas. Pre-deceased by Arthur after 60 years of marriage in October 1999; father Oliver, 1940; mother Clara, 1964; an infant daughter 1952; granddaughter Veronica Cropp, 2004; twin grandsons Trevor and Troy Barker 1982; great-granddaughter Wynne Barker 2000, great grandson Michael Barker 2013; six siblings - Clarence 1983 (Lamina 1991); Herman 1957; Calvin 2003 (Louise 2016); Olive 2004 (Elmer English 2005); Alice 1967 (Raymond Birkett 2010); Aaron 2017. She was also predeceased by many of Arthur’s family – siblings Ernie (Ruth); Ada (Joe); Edith (Henry); William; and Lily; survived by sister-in-law Joy Hilsley of London; many nieces & nephews in England.